Today we’re taking on a popularly disparaged film that actually fails to live down to its reputation by any means. While far from perfect and even a bit flaccid, there’s still enough of interest here to pique the attention of the average cult film fan. 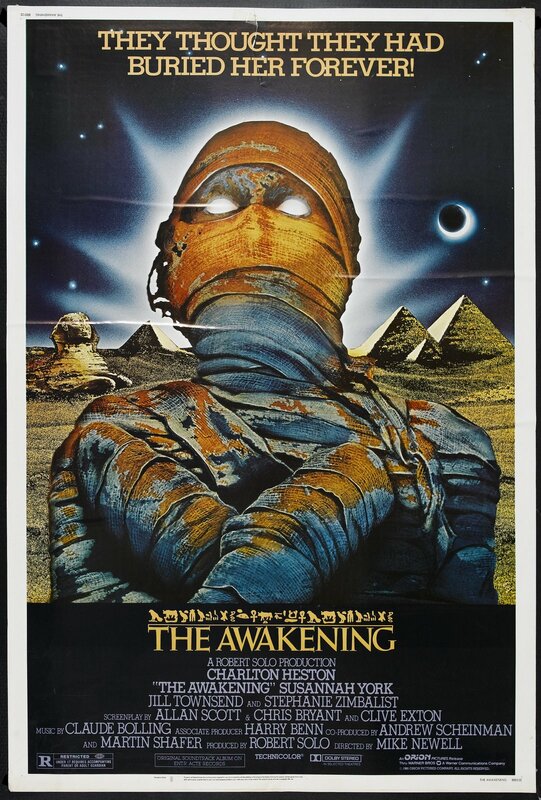 Commonly percieved as a financial flop and failed creative endeavor from the date of its release back in the halcyon days of 1980 (a year that still held its own as one of the glory days of horror, which would only begin a long decline into oblivion after the wildly prolific high water mark of the genre in 1981), The Awakening is in no way deserving of the critical and popular scorn rained upon it over the intervening years. Tapping into the same period zeitgeist that delivered the Omen and the Exorcist, though leaning far more towards the former in style and tone, the film concerns the still-fashionable milieu of the archaeological dig plagued by the curses of those long dead. With the first major US exhibition of King Tutankhamen’s remains and riches only 2 or 3 years past, Tut fever ran high – Steve Martin’s novelty hit (rather dubiously) in his honor topped the charts only a year or so prior, and the popular interest in Egyptology, mummies and the mysteries of history was still very much in the fore.